Vladimir Litvinenko. Biography. | Interportal "Fascism-XXI at your door"
Home » Vladimir Litvinenko » Vladimir Litvinenko. Biography. Vladimir Arkadevich Litvinenko was born May 5, 1958 in Kiev, Ukrainian SSR. He graduated from the Ryazan Higher twice Red Banner Airborne Command School (1982), finished post-graduate course at the Institute of Philosophy and Law of the Academy of Sciences of the Republic of Belarus (1994), refresher courses at the Military Academy of the General Staff of the Russian Armed Forces on "History and Philosophy of Science" (2007). Defended Ph.D. thesis at the Institute of Philosophy of Russian Academy of Sciences (1998). 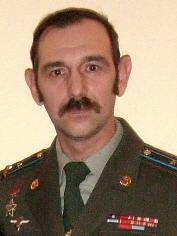 He served in the following positions: platoon commander, deputy company commander (The Odessa Military District, The Turkestan Military District, The Belorussian Military District, 1982-1992), assistant chief of Department of the Military Commissariat of Moscow (1992-2003), Deputy Chief of Department, Head of Department, Research Fellow, and Leading Researcher of the Institute of Military History of the Defense Ministry of Russia (2003-2011). Participated in military actions in Afghanistan (1988-1989), awarded the Order of the Red Star and medals. Reserve Colonel. Currently: Associate Professor of the Department of History, Philosophy and Cultural Studies at Sholokhov Moscow State University for Humanities.